Abdelaziz Alhanaee holds a BA in law from Dubai Police Academy and Diploma in Arbitration from Alexandria University. 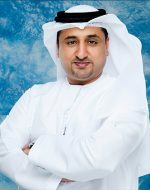 Abdelaziz Alhanaee practicing law since 2002 and he was a partner and head of litigation at Habib Al Mulla & Company (currently Baker & McKenzie/Habib Al Mulla) for over eight years. His experience prior to that was in the Ministry of Interior for seven years. Abdelaziz Alhanaee is specialized in Corporate and Commercial Law, handling criminal, civil and commercial cases. Alhanaee is licensed to appear before Emirate level and Federal Courts (court of First Instance, Appeal Court, Court of Cassation and The Supreme Court). We are one of the most important local law firms in Dubai, licensed to offer legal consultancy as per international standards and litigation under one roof in all courts in the UAE. Bruno dos Santos Pereira Reina Esther Pineda B.